Many factors can contribute to our overall happiness, and dream jobs we love are a top one. Working in a pleasant and rewarding environment goes a long way in helping us feel happier and more content, but sadly, many people aren’t working in their ideal occupations. In many cases, our own actions prevent us from landing dream jobs, and several factors might be holding job seekers back. Do you have big dreams, but put off the work to achieve them? Do you live by the motto “why do today what you can put off until tomorrow?” The people who are most successful in life rarely procrastinate because they understand procrastinators will always work from behind and try to play catch up. Successful people develop the discipline and skills to stay a step ahead, allowing them to accomplish more and reduce the stress on their lives. Procrastination is a major culprit when considering what keeps job seekers from finding their dream jobs. While postponing tedious tasks is tempting, it won’t help job seekers reach their goals. Instead, break large projects down into smaller, more manageable parts, and work on strengthening discipline and determination in order to achieve career goals. To find their dream jobs, job seekers must connect with people. They don’t need to become best friends with everyone, but having good social skills is a necessity. While submitting a resume to an interesting job is easy, make a good impression by reaching out to recruiting managers or other professionals to further connect. Even if job seekers aren’t ready to start their new job searches, they should practice their people skills by having conversations with colleagues, bringing in cookies for the next team meeting, or doing something nice for a stranger. Fear of failure words in red 3d letters and a man jumping over it to overcome a challenge such as anxiety or uncertainty. Photo courtesy of Shutterstock. Mental health professionals have determined losing a job can be as emotionally detrimental as losing a close family member. 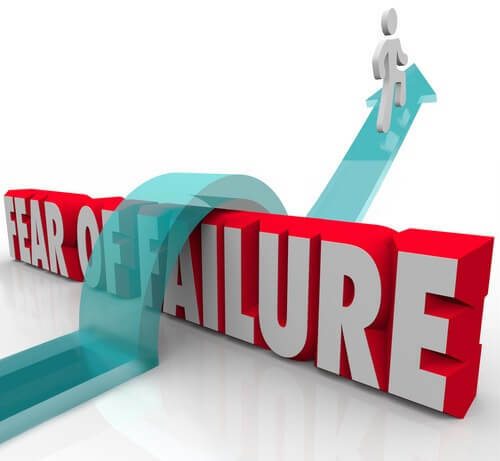 For that reason, it is pretty easy to see why the fear of failure is completely paralyzing to some people, and can leave someone complacent. Unfortunately, if people aren’t willing to take risks, they aren’t liable to get where they want to go. While job seekers shouldn’t make any rash or irresponsible decisions, sometimes they simply must take a leap of faith and see if they end up in their dream jobs. Additionally, getting the advice of motivational speakers can be a great resource in providing motivation to chase dreams despite a fear of failure. Do we find ourselves sticking to activities familiar to us? When is the last time we ventured out of our comfort zones and tried something completely new? Unfortunately, if we’re stuck in our comfort zones, we are really limiting our opportunities in life, including the potential to land our dream jobs. Luckily, there are ways to expand upon our comfort zones to find new opportunities. Take a proactive approach to improving flaws and try new things. Find a volunteer opportunity to connect with new people or learn a new skill. This builds stronger, more outgoing personalities in people and helps them learn new things from other different and interesting people. Expanding to try out brand new situations helps us gradually move out of our comfort zones and gives us the confidence to pursue our dream jobs. If we are extremely disorganized, we’re setting ourselves up for failure when it comes to getting the jobs we want. Fortunately, there are various ways we can increase our productivity and improve our organization skills, including helpful apps to assist us in creating to-do lists to keep on track with our workloads, projects, and activities. By better organizing our lives and the steps we take to get our dream jobs, we’ll identify our occupational priorities so we can move in the right direction. It is never too late to pursue our dreams, but we need to stop putting them off today. By identifying what exactly might be holding us back from our dream jobs, we can take the steps to eliminate obstacles and get where we want to be in life. Sandra Lambert is a CISCO certified computer networking specialist. She has a keen interest in writing about her knowledge and experiences. She writes about technology as well as about business. She has also developed interest in public speaking. You can follow her on Google+ and Twitter.